The Rental Housing Act (the RHA) applies to the leasing of residential property in South Africa and governs the relationship between tenants and landlords. If you are own residential property and you lease it to a tenant, you have to know and make sure you comply with the Rental Housing Act. There are serious consequences if you don’t – for example, you can be fined, you can even be imprisoned and you might have to pay damages to your tenant. If you are a tenant, the Rental Housing Act is your friend – it is a law enacted to protect you. cuts the utilities (like electricity) to the dwelling or locks the tenant out of the dwelling. Avoid penalties (if you’re the landlord) or protect your rights (if you’re the tenant) by getting a residential lease agreement template from us that complies with all the laws or asking us to review your current residential lease agreement template. If you are a tenant and are involved in a dispute with your landlord about the leasing of residential property, you can read more about what to do. What must be included in a lease agreement? all the obligations of both the tenant and the landlord. The Act automatically includes some terms in any residential lease agreement and are enforceable in any competent court. These terms may not be waived by the landlord or tenant, which means that neither the landlord not the tenant can agree that these terms will not be included. You need to know what these terms are. They are part of the lease agreement whether you like it or not. Even if the deemed provisions are not included explicitly in the lease agreement, the terms will still apply to the relationship. For example, the Act requires a deposit to be made into an interest-bearing account for the benefit of the tenant. Even if this is not included in the written agreement, the landlord must still pay the deposit into an interest-bearing account. Your lease agreement cannot contain terms that detract from the deemed terms of the Act. The landlord and the tenant can’t contract out of the deemed provisions. In addition to that, the parties cannot agree to terms that will constitute an unfair practice in terms of the regulations of the Act. For example, a tenant and a landlord cannot agree that the interest on the deposit will be for the benefit of the landlord. So, where does this leave the tenants rights in terms of the Consumer Protection Act? Well, as you may know, the CPA does not apply to all lease agreements. Both the Rental Housing Act and the Consumer Protection Act protect tenants. Tenants leasing residential property have more rights than those who lease commercial property. More laws govern the leasing of a residential property than commercial property. The principal Act commenced on 1 August 2000 and various amendments followed. 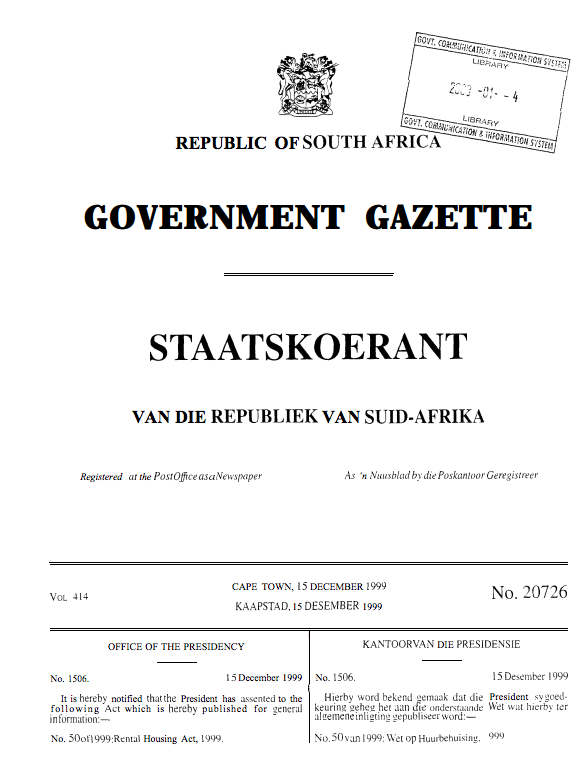 The 2007 Amendment Act created a body called the Rental Housing Tribunal (with one in some provinces like the Western Cape, Gauteng, Kwa-Zulu Natal) to settle disputes between the parties to residential lease agreements. The latest amendment was in 2014 but we are still waiting for the commencement date of the amendment act.